Celebrating 28 years of Gallatin River Adventures...! Gallatin River - Includes lunch, more whitewater and the best rafting value! Arrive at 9:30 am and return around 4 pm. ﻿Whether you just can't get enough of the guides humor or you're just hoping for the best day on the river, the Full Day Rafting Trip is your adventure. Nothing beats pushing off into the river on a clear sunny morning in anticipation of the days fun to be had. The morning starts out relatively calm. Enjoy the sounds of nature and maybe an occasional wildlife sighting. We try to stay dry for a bit but that comes to an end as we navigate some of the morning's rapids like Portal Creek and Sheepeater. There will be time to use a restroom before we continue and then we'll gear up for the afternoon's thrills. Rapids like Screaming Left, Hilarity Hole and the infamous Mad Mile await. If you aren't wet enough by the end, we can always stop off at one of our favorite swimming holes before the end of the trip. Prefer a Half Day Trip? All participants of Geyser Whitewater Expeditions, Inc. activities will have to sign a release of liability and an assumption of risk document. By signing this document you may be waiving your legal right to a jury trial to hold the provider legally responsible for any injuries or damages resulting from risks inherent in the sport or recreational opportunity or for any injuries or damages you may suffer due to the provider's ordinary negligence that are the result of the provider's failure to exercise reasonable care. Minimum age restrictions vary with water conditions. ​Participants can exit the river at any point during any of our rafting trips, for any reason. Additionally, any rapid can be portaged at the guests request. 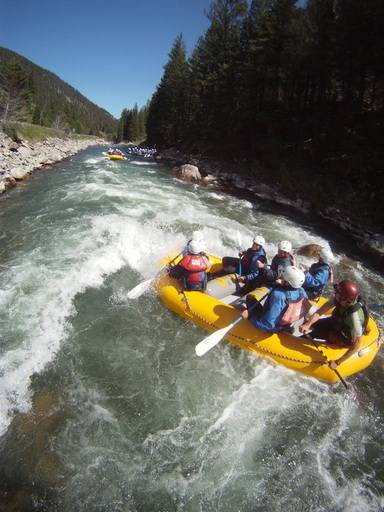 It is the participants responsibility to understand the different classes of rapids and the nature of the rafting trip they are participating. We need a 24 hour notice and there is a 50% fee for same day cancellations and no shows....If you purchase the Cancellation Insurance you can cancel or reschedule your rafting at any time. $5 per person. The cancellation insurance does not apply to zip line or horseback portions of packages which are operated by 3rd parties.